With the NFL season coming to a close, we thought we’d celebrate one of our favorite parts of game day at the stadium: the game day eats! In our book, there is only one way to win at stadium food: as a concession stand, you’ve got to bring a uniqueness in your food that matches the unique characteristics of your town’s fans and culture. Note: All of these Top 10’s have been specially selected for the smart game day eater. So graze wisely, friends. Have you ever paid $75 for a burger? Probably not. But we think it’s safe to say, most stadiums overcharge for their food and as you walk away with you food you can’t help but feel you’ve just spent $75. (Hence our love of tailgating). Anyhoo, this 7-pound behemoth, aptly named the Gridiron Burger, will make even the most seasoned eaters pull a Neymar. If one person actually does pull off the upset in 1 hour or less, he or she gets his/her picture posted to the Stadium Scoreboard as well as a Cards jersey. You can’t really put a price on pride. Check out our recipe for an amazing burger here. Don’t let the pretty picture fool you, this is right in our wheelhouse. The Battle Red Tacos at NRG are a demented combo of Flamin’ Hot Cheetos-crusted chicken tenders, mango pico de gallo and Sriracha mayonnaise, all cradled in a flour tortilla. That’s enough for us to become Texan converts. (But for part of our Hungry Fan team, which includes a Massachusetts contingent, it’s still not enough to become Texans fans). PRO TIP: Don’t forget to ask for extra Sriracha mayo. It’s already a caloric-bomb, so go big. You’re in Texas after all. Here’s four different variations of how to make dessert nachos in one video. Mind blown. If the Pats don’t make Chiefs fans cry, the Kingdom Inferno Chicken Sandwich will undoubtably do so. Have you ever heard of the Carolina Reaper Pepper? It’s officially the worlds hottest pepper. And eating too much of one in one sitting can actually kill you. (For real, so be careful). So what did the geniuses at Arrowhead Stadium go and do? They went and made this insanely hot pepper into an aioli and slathered it on this sandwich. THEN, they topped the sandwich with jalapeño jack cheese and more fresh jalapeños. We’re not saying that everyone in Kansas City has a death wish, but this sandwich will absolutely take you to the edge. Sound fun? Buy Carolina Reaper Peppers here. Just when we think the double down cannot be topped, Nashville went and came up with this little devil straight from the gates of hell. Behold the Nashville Hot Chicken Waffle. Since Nashville Hot Chicken and chicken and waffles are having a bit of a moment right now, why not up the ante and combine them. In this diabolical mash up, they take fried chicken add a ton of homemade hot pepper sauce (enough for you to thoroughly regret it), and slap it between two freshly made waffles. Breakfast, lunch or dinner—this may be the best/worst idea ever conceived. Know the weird origin of Nashville Hot Chicken? Thank you NPR. The best offense is a great defense, but in this case, the best offense is being offensive. Up in Buffalo, some crazy person decided to take the most common and humble sandwich here in America and do what carneys do…deep fry it. 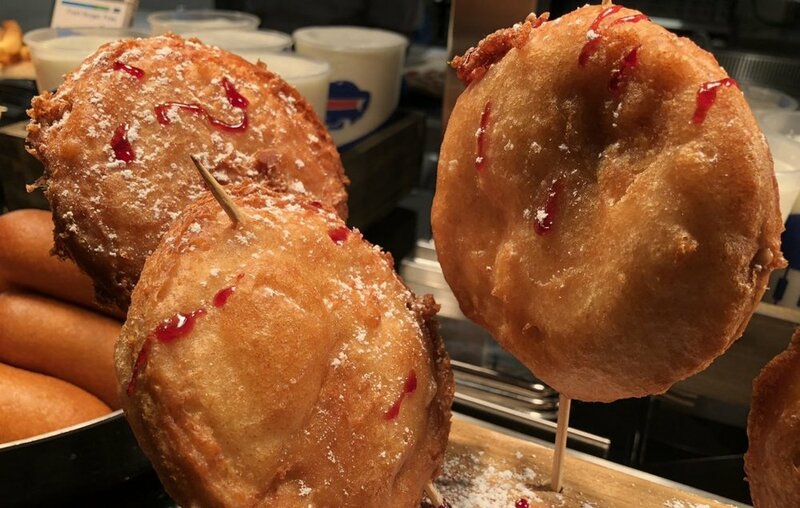 The Deep Fried PB&J has nothing to do with Buffalo other than the fact that Buffalonians like to deep fry things from time to time. But we gotta say, this is a crazy little bit of genius. That said, we must add this WARNING: Do not eat this fantastic morsel right away or its offense will splatter all over your face with all of its molten jelly goodness. Second degree burns aside, it is well worth it. Watch this slo-mo vid of someone getting badly burned eating it here. What ever happened to the teriyaki of the 90’s? It seemingly disappeared from our radar after its explosion in popularity, but recently decided to make yet another comeback in Cincinnati in the form of Teriyaki Beef Tater Tots. But unlike Tim Tebow, we are so happy teriyaki has officially returned. In Cincinnati’s case, they are already in love with tater tots and proud to be about 20 years behind the trend, so this game day meal is the rough embodiment of Cincy in 2019. No chopsticks needed, just a burning desire to go for it all with zero regard for winning or losing. Are you a tater tot connoisseur? Take this quiz to find out. Let us food-geek-out for a bit on this one. Dungeness crab is literally a food of the gods; soft but also firm, salty but also sweet, light but also rich. Moving quickly on to the pretzel roll, which, as a food innovation, can only be compared in the same breath of other-worldly-clairvoyance to the invention of yoga pants. Combine them and you have a Guy Fieri-esque flavor bomb of mammoth proportions aptly called the Dungeness Crab Pretzel. Salty, sweet, chewy, creamy, salty, sweet, chewy, creamy, salty, sweet, chewy, creamy, and salty. Sorry. We may need a moment to regain our composure. Wait…is that sandwich looking at me? We’re gone. Watch how they catch these prehistoric crustaceans. Holy crab! Not saying we want a side by side, but this dog has the hardest bite we’ve seen to date. Coming in at a more than girthy twelve inches, The Pit Bull also comes with a heaping amount of pit beef (a Maryland specialty), horseradish mustard, and a ton of colorful giardiniera for the Italian in all of us. If you are looking for a high protein meal post-workout and pre-game watching, this is your front row ticket to the promised land. Just don’t bet on the Redskins. PRO TIP: Eat this on an empty stomach. Here is a pretty good homemade giardiniera recipe. We almost feel like it’s not fair throw an Iron Chef’s creation into a stadium, but you gotta throw a dog a bone every once in a while. Basically, until this season, the Browns hadn’t won in almost two years… Not a joke. 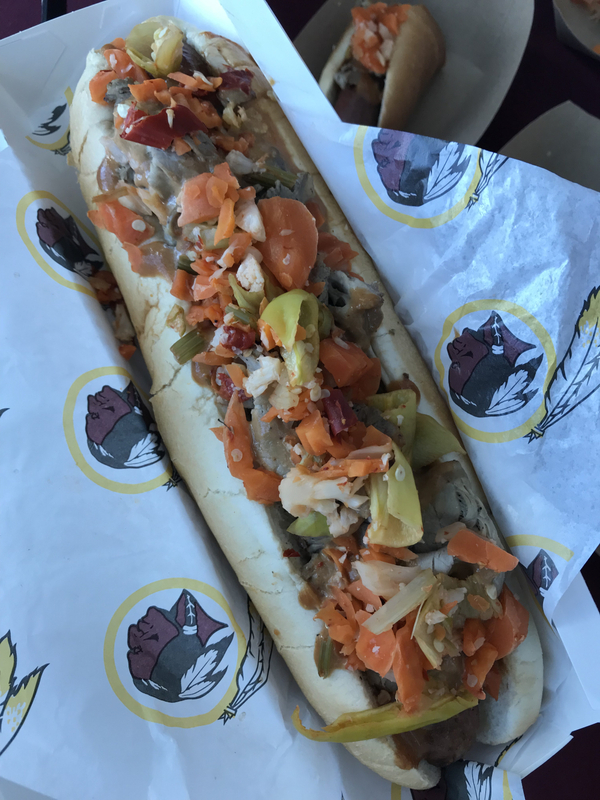 But thanks to the kindness of Michael Symon, who bestowed the Red Zone Bratwurst upon Brown’s fans in 2018, fans actually had something to look forward to seeing when they went to a game. 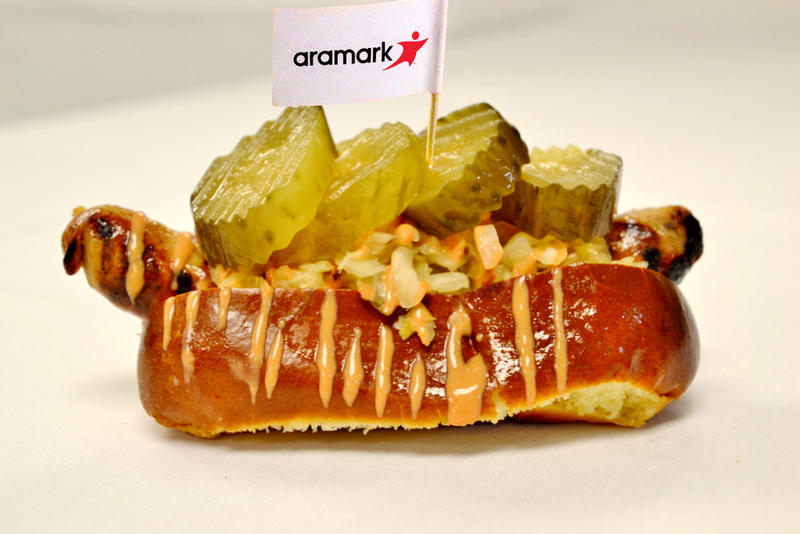 The bratwurst is braised in Cleveland tears (aka beer), covered in a quick slather of Cleveland Famous Bertman Original spicy mustard, and is then topped with caraway Cleveland Kraut and Tony Paco’s pickles. Venture to guess where Tony’s from? PRO TIP: If you’re a Browns fan, don’t read what we wrote above. Find Cleveland’s cult stadium mustard here.